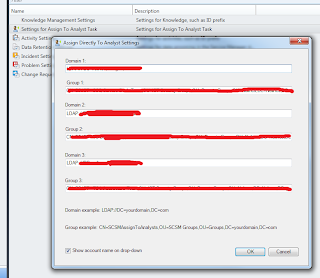 Rob Ford has greated a great little management pack that adds a task for assigning an incident to an analyst, but uses up to 3 AD groups to filter the list down rather than being presented with all the users in AD as is the annoying OOB experience. And finally, a pop up window to assign the incident with a filtered list! And just to make it even better, he's made the source code available too so you can customise it even more.